Tomie dePaola is one of my favorite illustrators. I’ve collected his books for years. I love the simplistic way he paints! The stories he depicts are timeless. If you know and enjoy dePaola’s work, you will appreciate The Friendly Beasts. Based on an old English Christmas Carol, the story of the birth of Christ is told by the animals of Jerusalem. The book is lovely and contains few words, but many colorful pictures. The words and music to the song by the same name are included. It’s another wonderful children’s Christmas story to add to your collection. Check out his others as well! The Clown of God is one of my all-time favorites. 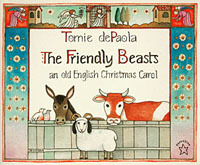 This entry was posted in Uncategorized and tagged Books, children, Christmas songs, The Friendly Beasts, Tomie dePaola. Bookmark the permalink.